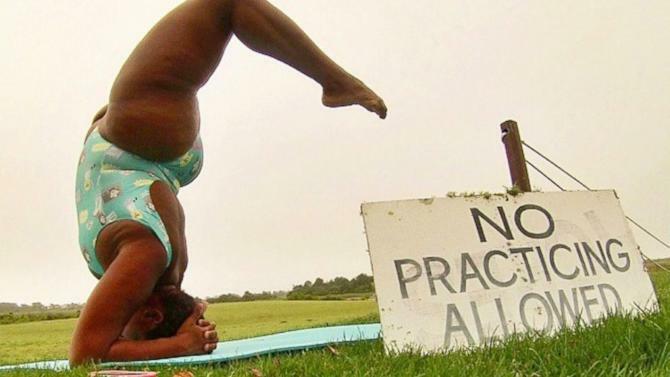 A North Carolina yogi is causing a sensation on social media by breaking down body stereotypes with her personal photos. Jessamyn Stanley, 27, who lives in Raleigh-Durham, North Carolina, and posts to Instagram under the handle @mynameisjessamyn, has attracted more than 42,000 followers in the last two years sharing images of challenging forearm stands and intense back bends. The difference between Stanley and the seemingly myriad talented yogis posting online? She is a self-described “fat femme” with ample curves where others are stick straight. A lifelong North Carolinian, Stanley was first introduced to Bikram yoga as a teenager by an enthusiastic aunt. But at the time, she was put off by the high-temperature rooms and studio experience. Years later, in college, when a friend mentioned a Groupon discount for Bikram classes, Stanley decided to give the practice a second try and this time something clicked. But after committing to a regular practice, Stanley eventually moved and didn’t immediately have the disposable income to attend studio classes in her new neighborhood. It was then that she began doing yoga at home and documenting the experience online. The attention she’s since received does at times detract from the original intent of recording her postures. But, Stanley reasoned, it’s not a bad thing. Stanley, who currently also teaches classes in Durham, N.C., will embark on a yoga tour in select cities this fall with a fellow “curvaceous teacher.” There are also plans for a full-figured retreat next year. Alright Stanley, live your life inspired…and in the process be an inspiration to us all.